Things that can make your Spouse Feel Happy! 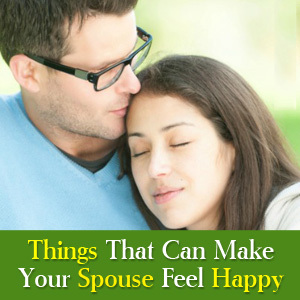 » Things that can make your Spouse Feel Happy! Marriage is a life-long commitment where you and your spouse have to lead many happy and healthy years together. There are several things that you can do to brighten your partner's day. Sweet and loving gestures are simple to make but often neglected, and this sometimes affects the finesse of the relationship. At times small things that you do for your loved one can mean more than any expensive gifts. Try some of these simple yet basic tips, and show that you do care for your spouse. Follow the language of love : Gary Chapman, author of "The 5 Love Languages" says that different people have different modes of love language to express their love. For instance, your spouse might be using loving words, or physical affection as love language. Some people lend a hand in helping their spouse, and prefer in spending quality time with them. Even a surprise poem or love note can mean more than a costly gift or bunch of flowers. Another obvious method would be to directly ask your wife about the mode in which she prefers the conveyance of love. Compliment them : Your spouse might be a homemaker or an office-goer. Try complementing your spouse for things, small and big alike. Don't remind him or her about their flaws; instead appreciate them for what they are. Offer a hug when your spouse brings you a cup of tea or even when mowing the lawn. The best moment to win your spouse's heart is by exclaiming how well you enjoyed the food during dinner. Such simple deeds will boost your partner's confidence in you, and that will give them a realization that they are indeed being loved and cared. A nice breakfast : Prepare the favorite dish for your spouse during breakfast. Try bringing some coffee or tea on a cozy tray with a newspaper or bunch of flowers. This will be a good start for your spouse and will surely earn you a cuddle. Be tactful : You can do many things to lighten the load of your spouse, like helping them in washing clothes at night. Buying grocery items, milk and other useful things without being asked will be really acknowledged. If your partner falls ill, give extra care and warmth that will really make them feel special. The above said are some simple steps that you can pursue for your beloved spouse.